Hamdard is an age-old Unani medicine manufacturer from India, and their products are very famous because of their effectiveness in treating various health problem. Today, I am going to share my experience with Hamdard’s Joshina. My intimacy to Joshina, a preventive medicine for common cold, started eight years back when my father advice me to take Joshina when I observed symptoms of a cold. Following advice of my father, I took two tablespoons of Joshina with hot water, and to my surprise, I felt quite well even after a single dose. At that time, I first realized that Joshina is a great medicine to prevent common cold. So , whenever I feel like getting cold, or see initial symptoms of common cold, I immediately take Hamdard’s Joshina. It may not be a 100% solution for the common cold; however, it's very-very effective in treating initial stage of common cold. Now, it is common to find one bottle of Joshina at our home, and every member of the family takes it whenever he feels like getting cold. I will strongly suggest, instead of using expensive and harmful drugs, one should try Joshina, a natural product. The main miracle is done by natural ingredients present in Joshina which provides extra heat to our body and kills harmful bacteria responsible for common cold. The common natural ingredients in Joshina are Alsi, Maghz Amaltas, Burge Bansa, Burge Gawzaban, Dama Booti, Sate Podina, Roghan Tulsi, Tukkm Khatmi, Rube Mulethi, Tukhm Khubbazi, Sapistan, Unnab, and Naushadar powder. Most of these ingredients like Tulsi, Poodina and Mulethi are individually used in Indian homes to prevent common cold, and they give great power to Joshina. 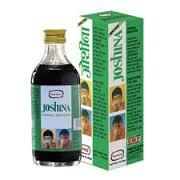 So, next time when you see initial signs of common cold then you should try Joshina, and observe yourself its benefits. I have found this product very useful, and I hope that it will benefit others too. Absolutely and totally effective. Two tsps mixed in one cup hot water, sipped like tea 2-3 times a day worked wonders for me! Continuous use over a few days will clear the chest thoroughly of any congestion and phlegm. Does joshina contain asprin or steroid? Can I give to my child? It's a herbal product. No aspirin or steroids, you can safely give to child but read the dosage instruction on the box. Is this useful for asthma patient. Can it be given to a 2-year old? No, FOr a 2 Year old child always give any medicine after consulting a Pediatric. Can pregnant lady take joshina?